A research team led by USC scientists has developed a new way to identify molecular markers of breast cancer tumors, a potentially life-saving breakthrough that could lead to better treatment for millions of women. 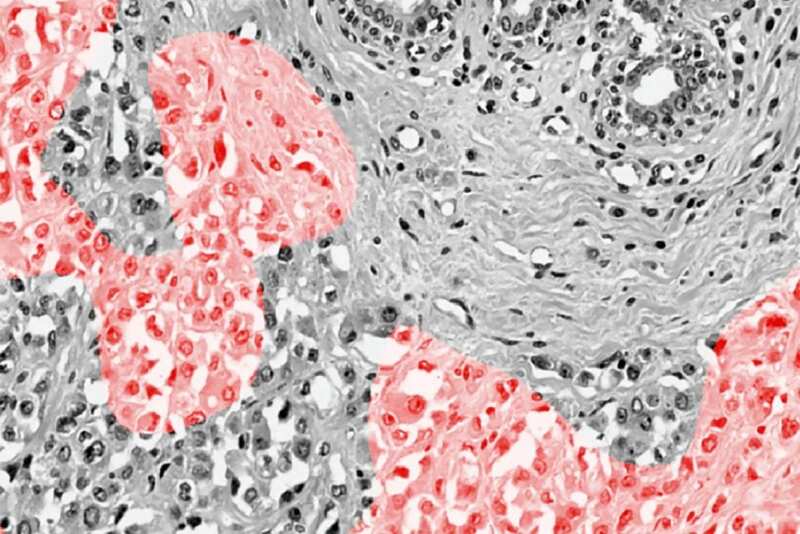 Aided by machine learning, the researchers taught a computer to rapidly sort images of breast tumors to identify which ones had estrogen receptors, a key to determining prognosis and treatment options. That's a big step forward from microscopes and cell biopsies in use for more than a century, according to the scientists. The work opens a new pathway for breast cancer treatment that promises faster results for less cost for more people worldwide, said David B. Agus, professor at the Keck School of Medicine of USC and the USC Viterbi School of Engineering. He is also CEO of the Lawrence J. Ellison Institute for Transformative Medicine of USC. "It's the beginning of a revolution to use machine learning to get new information about breast cancer to the physician," Agus said. "We can use it to detect better treatments, get information to patients faster and help more people. We're unleashing this power to give new information to physicians and help treat cancer." About 237,000 cases of breast cancer are diagnosed in U.S. women and about 41,000 die from the disease each year, according to the U.S. Centers for Disease Control and Prevention. For example, assays can be inconsistent depending on the laboratory doing the testing. They're also expensive, take weeks to do and are unavailable in many developing countries. "If you're diagnosed with cancer, it'll be a few weeks before you get a call from the doctor saying they've identified a marker," said Dan Ruderman, one of the study authors and assistant professor of research medicine at the Keck School of Medicine. "With machine learning technology, we can tell you the same day, so there's less delay, less stress and potentially better outcomes. It's going to enable us to identify the right drug and dose more quickly. It's a big step toward personalized medicine." While machine learning has been used before for cancer detection, the USC study adapted the technology to more clearly focus on telltale markers of a cell's nucleus. The key was to extract parameters describing the shape of nuclei, and feeding these into a large neural network that could learn relationships between nucleus shape and molecular markers. The scientists used publicly available hematoxylin-eosin (H&E) stained histopathology images. the cell-stained slides doctors have been using for more than a century. Next, they ascertained clinical status for 113 cancer patients, then split the patients into two groups, using one group to train a convolutional neural network algorithm, which is used to enhance visual imagery, and another to test the machine. When they compared the two sets, they found a strong correlation, providing high confidence that an algorithm can predict the estrogen receptor status of the tumor. "We can use this technology to identify the molecular markers of the tumor and in the future will identify which therapeutics the tumor will respond to. Machine learning helps us get this information to patients sooner and may transform cancer care in the developing world where precise breast cancer marker assessment is in short supply," said Rishi Rawat, a graduate student in the Keck School of Medicine and first author of the study. The study authors are Agus, Rawat and Ruderman of the Lawrence J. Ellison Institute for Transformative Medicine of USC; Paul Macklin of Intelligent Systems Engineering at Indiana University; and David L. Rimm of the Department of Pathology at the Yale University School of Medicine.